Can anybody please tell me what the night club was called at Owler Bar (now the Moorlands Carvery) which was open in the early 70's, and when it closed? I also understand that before it re-opened as the Moorlands it was a pub called Five Ways, if it wasn't called that what was it called? The five ways are the roads from 1.Barlow, 2.Baslow, 3. Fox House 4.Totley, 5.Holmesfield which all converge onto the MASSIVE aroundabout. The the older Peacock is on the other side of the roundabout. Brilliant! Thanks. As I remember it had an allegedly dodgy reputation? 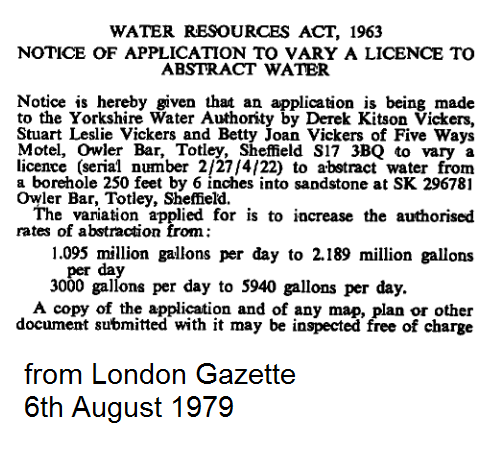 So why were they taking a couple of million gallons of water a day - more than needed to water down the beer surely? I think there may be in a typo here. 3000 galls per day = 1095 mm gallons per year. Yep, it was Fiveways Motel, and the night club was Fanny's. Last time I went to Fanny's was definitely '87. The beginnings of "House Music". First time I went to the Whitbreads pub/restaurant, was '90 or '91. I'm pretty sure it was called Moorlands then, but I wouldn't rule out it having another name inbetween those two. Fanny's became less popular when closing time was extended to 11:00 everywhere. Before then, lots of people went out to Derbyshire at weekends for the 11:00 closing time, and went to Fanny's on the way back. I seem to remember a number 24 bus which left for Sheffield at 12:00? Or was it later? If you missed it, you could walk two miles to Totley, and there was a later one from there. Would a motel require 6000 gallons of water per day? Doesn't sound too excessive if they are busy, and running at full capacity.